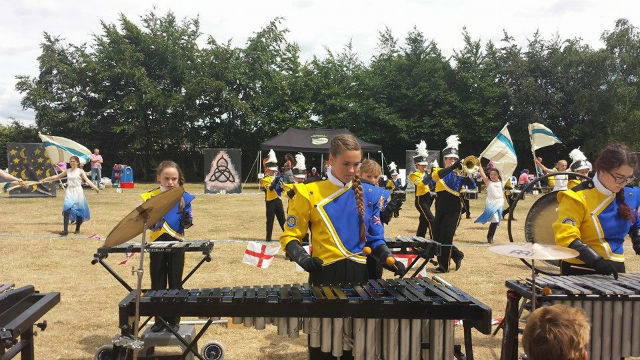 Thurrock Marching Brass were proud to take part in a community event held at the Deneholm School on Saturday 28 June 2014 where they entertained an appreciative crowd at the school’s annual fete. The weather managed to hold up for the performance after a rather blustery and wet morning and early afternoon just prior and the members really enjoyed showing off what they had learned so far with their 2014 summer season competitive program entitled “The Sound of Magic”. This proved to be a really good dress rehearsal for the following day’s competition that would see this young, up and coming group travel to Woking in Surrey to compete for the first time this year and to try and extend their unbeaten streak (the last time this young band were defeated was at the British Youth Band Association National Championships in 2012 where they were very narrowly beaten into second place in the Cadet Class Championships). Sporting their new shako hats and plumes for the performance they were very well received by everyone there and the staff were very pleased with what they achieved. Speaking of the event, Assistant Corps Director and Head of Winter Programming, Ken Mansfield commented “It never ceases to amaze me just how much young people can achieve with the right support structures and surroundings for them. 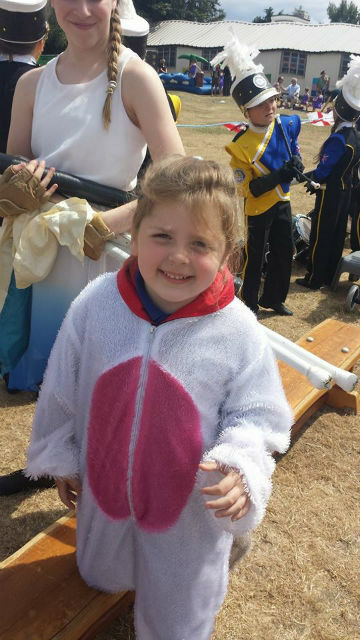 Our youngsters have not only developed some incredible skills, but some of them have never even picked up an instrument until a few short months ago. Community events are a key part of our calendar and one that I feel very strongly about ensuring that we continue to take part in. We are an organisation born from the community and to give back by way of showcasing the talents of the youngsters, which come from within it, is always a great pleasure to experience. Each and every one of our members did a great job today and we are all really pleased and proud of them. This was a good dress rehearsal for us too in readiness for our first competition of the season at Woking tomorrow. I would like to thank everyone who helps in all capacities who have contributed to making this year’s program so enjoyable”. Posted by News Editor on Monday, June 30th, 2014. Filed under Current News, Drum Corps U.K., FrontPage Feature.